After seven years here in the ‘Peg, I sometimes think I’ve heard about all the “Winnipeg things” there are to hear about. But every now and then a new one pops up. My massage therapist and I often talk about food during treatments and about this time last year, as we were discussing Christmas treats, she mentioned that one item she always makes for the holidays is a chocolate treat called Cuban Lunch – something I’d never heard of, despite being quite enthusiastic about holiday sweets. She said Cuban Lunch was a chocolate bar she loved as a kid, and that this was a homemade version. I was sold and wanted to make them right away, but alas, everywhere I went was sold out of butterscotch chips, so my hopes were dashed. This year, I was still thinking about them, so I made sure I secured the chips in November so I’d be ready for holiday baking. A few nights ago I prepared the recipe — a bag of peanut butter chips, a bag of milk chocolate chips, a bag of butterscotch chips, and a cup and a half each of crushed salted peanuts and crushed ripple chips — and filled up dozens of little foil candy cups with the sweet concoction. After they’d set, I tried one – and they were pretty good, though my husband and I thought we’d use more peanuts and chips the next time, along with a nice dark chocolate chip instead of milk chocolate chips – they are awfully sweet. They were made right here in Winnipeg! I saw some references to Wikipedia saying Cuban Lunch was primarily distributed in Western Canada, but I can’t find that on Wikipeda at present. Apparently the chocolate bar was just peanuts and dark chocolate. Not sure how the ripple chips came to be in the homemade version. Trademark registration record – I can’t make much sense of this, but it seems that the name Cuban Lunch may have been used in Canada as early as 1948, and the trademark was automatically expunged this year after the current owner failed to renew it. So – dear readers, you have always been a fountain of knowledge and I’m sure someone around here can give us the inside scoop — I know there are some Paulin’s Puffs lovers out there; maybe somebody knows more about the company? What’s the story behind the name? When did they stop being made? Were there chips in the original? Until then, I’ll be trying not to eat all the 80 knock-off Cuban Lunches currently in my freezer, awaiting their dispatch to dainty platters and care packages. Wish me luck! This entry was posted on Tuesday, December 1st, 2015 at 1:52 pm. Cuban Lunch. Yes, I remember that, particularly the red wrapper, but haven’t seen or had one in many years — ’80s or ’90s I reckon. It was basically chocolate mixed with ground-up nuts, definitely not chips. Paulins also made a confection called Pep Chew, a minty nougat with chocolate coating – I miss them more than I miss Cuban Lunch bars. Yes! The commercial ones and the Christmas homemade ones aren’t the same; original didn’t have potato chips in them, just peanuts, but I think they were more than just chocolate. So I’m not sure why they have the same name, but they’re both delicious! Yes, they were made in Winnipeg. They were a Paulin’s product. They had a plant in the Exchange District and made lunch, popcorn, crackers, cookies – including Paulin’s Puff’s (the chocolate covered marshmallows with a raspberry jam centre). The company was Toronto-based and had plants there and in Winnipeg. As for lunch itself, not sure when they started and stopped manufacturing them. I know someone who studies snack food history, if she can enlighten me I will pass the information on ! I must of been about 2 or 3 when my Dad bought me my first “Cuban Lunch” bar. It came in a clear wrapper with red lettering on a white background of about 1/8th of an inch around the edges. The bar was in a pleated brown wax paper and as in some of the photos,was a square with rounded corners. I’ve posted some of my other memories to my facebook page rmginter@facebook.com. Two other candy bars of my youth in Winnipeg were Pie Face and Fat Emma though I don’t know if they were locally produced. They disappeared long before Cuban Lunch. I don’t know if I have seen them since the 1960s. Don — Nice! My dad used to talk about Fat Emma, which he also ate as a kid growing up in Winnipeg. Yes! I remember them. Childhood fave! Peanuts (chopped, but not too fine) & milk chocolate. I kind of aged out of them in the mid 1980’s…don’t remember when they disappeared. I do remember hearing the story as a kid that somebody brought some Cuban treat back from honeymoon after the war & it took the creator years to copy the recipe as it was too simple, LOL…I think the original was supposed to have rum in it…but they couldn’t get it right. I loved Cuban Lunch as a child 50 years ago. The chocolate was not milk chocolate, but didn’t have a particularly high cocoa mass either. Only peanuts –no potato chips. I did all my eating in Edmonton, Alberta, where the bars were plentiful when I was little, and less so as time went on. I think I could get a pretty good approximation with chocolate chips thinned with a little coconut fat, and as many chopped peanuts as the chocolate will hold. I think that they were made with Carob, not chocolate. Was searching for A place to purchase Cuban lunch for a bit of nostalgia for my dad’s birthday. They remind me of him, it was our favorite treat from him as a kid. My dad used to work at Nutty Club in Winnipeg and also loved the puffs, they were probably all made at that factory. Sad they have been discontinued. Another flash back is the WigWam, another great lost bar. 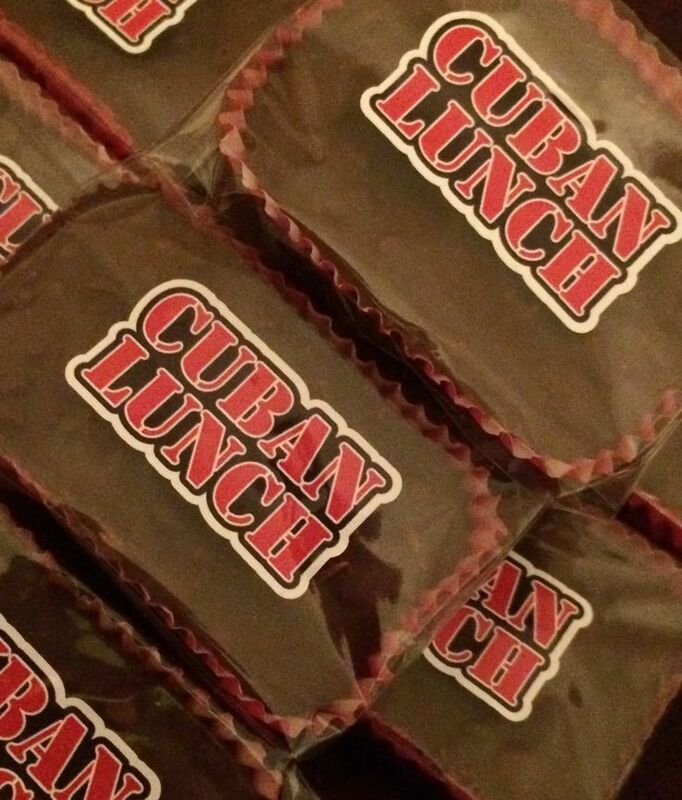 The Cuban Lunch chocolate bar that I remember as a kid had a red rectangular 1/2 inch deep cupcake style parchment resembling cup with the corners pinked. It was wrapped with a clear but printed on cellophane wrapper that was assembled and glued together underneath. It was chocolate and Spanish Peanut chips or chunks. Any other style to me ( respectfully however) is adulterated as my opinion of what my memory is of Cuban Lunch chocolate Bar. I so forgot about the fabulous Cuban Lunch Bar! Came across this website tonight while on the hunt to find out what happened to the rich awesome Raspberry sandwich cookies that may have been made by Paulins or one of the older brand-name cookie companies that are no longer on the shelf. The package held about 5-6 cookies wide and probably 4 rows long. The cookies were made of a rich smooth, I think brown sugar, shortbread texture and were filled with raspberry jam. The top cookie had a small hole in the center. The cookie was patterned with a lattice pattern on top and had a little scalloped edge. They were so rich and smooth, you just wanted more! The price was more expensive than other cookies on the shelf and were available until about 10-15 years ago. I know the Co-op and IGA both carried them. If anyone knows if they are still out there and if so who sells them, I would love to know. Thanks. I just found this discussion after Googling Cuban Lunch. I too loved them as a kid – it was a treat I shared with my dad (funny that seems to be a familiar thread in this discussion!) I was born in Ottawa (1968) mand moved to Victoria when I was 10 and I remember them being available both in Ontario and B.C. Sadly I think I stopped seeing them in the mid-80s. 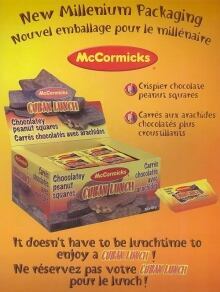 Too bad – they were simple – Spanish peanuts and chocolate (no potato chips) but tasty. And not horrendously sweet. Never knew they were a Winnipeg speciality but definitely a Canadian-only product. I miss them. And the Puffs! You can get other versions but none of them are exactly right. Yes, Growing up in Winnipeg in the thirties and forties, I remember ‘Cuban Lunch’ and ‘Pie Face’ and ‘Fat Emma’!And ‘Sweet Marie’ by Paulin’s — and the latter’s cousin — ‘Denver Sandwich’ by Weston’s! I also remember ‘Lowneys Bundles’ which were separate sticks of milk chocolate wrapped in a bundle of four or five –like a pack of gum; I can almost remember the maroon package and the tinfoil! Can anyone else? Also, there were two other local chocolate manufactures in Winnipeg — Galpern’s and Shore Candy Company, but I can’t remember the names of their chocolate bars! Anyone? I remember just about all of these chocolate bars from the 1960s on Vancouver Island. My best friend’s family ran a corner store, so we had our fill of candy. Does anyone in western Canada remember the Mrs. Williams company? They made things you bought ready made at the grocery store..pound cakes, Swiss roles, little donuts, butter tarts, etc. Really yummy stuff. I miss them. Cuban Lunch was my Dad’s favourite as well. In New Zealand, there is a chocolate brand that makes a bar called ” Peanut Slab” It’s the same as a cuban lunch, and they have many varaties. Whittakers is imported into Canada, and I discovered some of their bigger bars, but not Peanut slabs; yet! 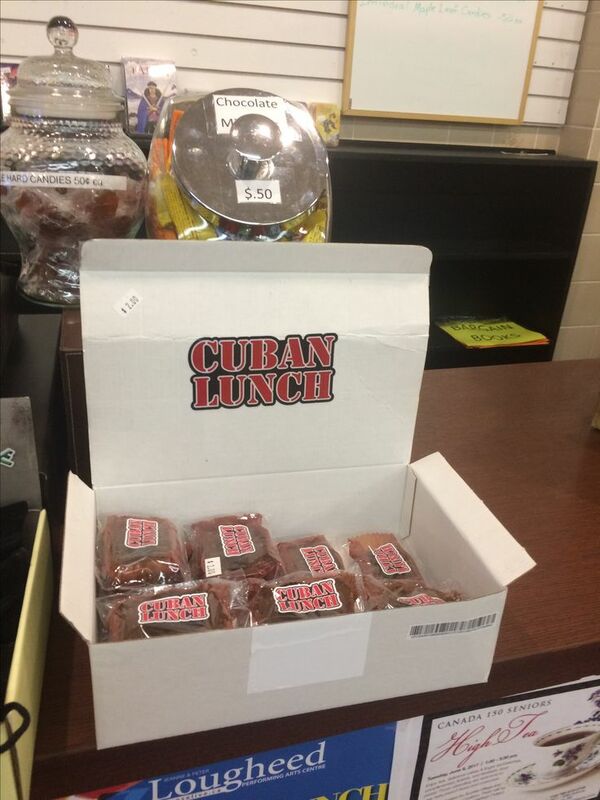 My boys have been asking if Nana is bringing the Cuban Lunch treats this Christmas and are curious why they are named so. Thanks for the blog. I will share what I’ve learned. We have been in the West for years but Nana (who grew up in Winnipeg) has been making the recipe every year for Christmas and they travel many miles. Thanks for the information about the possible Canadian origins of the treat. We are of English / Irish / Scottish / Icelandic decent – so we are sure to have Shortbread and Vinarterta on the table too. We will make sure we use Spanish peanuts… and we too have put away butterscotch chipits in the event they sell out. I live in grande prairie (northern Alberta). And there common here at Christmas too. My grandma was making this in at least the 80’s. Not sure the chocolate mixture. But.. with the peanuts and the ripple chips. She been sick for the 5 years that my and my wife been together and never did her baking at Xmas. And she died this spring. This year my wife in charge of the Xmas baking and claimed. She never had these before ( she from van. Island). My grandma was born and raised in northern Alberta. No ties to Winnipeg. So I don’t think it’s just a local thing. Yes, I too remember the Cuban Lunches. They were available almost everywhere here in the Fraser Valley, specifically Agassiz and Chilliwack, and surrounding towns. That was from 1954-55 (when I started Grade 1, so I was becoming cognizant about things) till the Seventies at least. The descriptions given here are pretty well right on. Spanish peanuts and a great, easily melted chocolate, and nothing else. I think I kinda read on the wrapper (clear cellophane as described), that they were made or distributed by Ganongs (sp?) or something like that… but I wouldn’t bet on it, though. Swiss cheese for brains now-a-days…. All those candy bars that no longer are available… sigh!!! Also, definitely no chips or corn flakes, just peanuts and chocolate (closer to milk chocolate than dark chocolate). And maybe a hint of coffee? Surely some candy mogul has the recipe sitting in a desk drawer somewhere. Let’s bring it back, please! I married a NHL hockey player from the “Peg”, in 1974. I’m from NY. I fell in love with the Cuban Lunch. We would buy boxes back to the states with us. When he would play in Canada he’d try his best to bring them back but, most time zero luck. I know know the story however, how I miss them. I don’t understand why they were discontinued. Does anyone know the reason? I’m returning from Australia to Saskatchewan in a couple of months and was reminiscing last night about my summertime favourite sweets at the tuck shop at ‘the lake’. Cuban Lunch popped back into my mind as if it was yesterday. Would be late 50’s and through the 60’s in Saskatchewan. Apart from the great taste of loads of Spanish peanuts held together by chocolate, the packaging was interesting because it was so very different from anything else. The Cuban Lunch was a perfect shape, perfect thickness. Just yummy. Yes, I’d love the original recipe. My friend is making them again! Cuban Lunch was a bery popular bar in the little town in Sask. where I hrew up. My parents owned a grocery srore with a big glass camdy case and I stocked ot with Cuban Lumch, Far Emma (pink centre) amd Pie Face (chocolate cemtre) and all the penny candy. Jaw. realers 3 for a cent. The potatoe chips I remember were the first Onion and Garlic by Hunters in the green foil package. They were the best, better than Old Dutch and a ton better than Hostess. I remember the Cuban Lunch jingle. Can not remember if I heard it somewhere or if I made it up! A lady in Camrose Alberta bought the Cuban Lunch Trademark most recently. She is preparing to launch the CUBAN LUNCH bar. I remember eating them back in the 70’s, my favourite bar. Since I am now married to a Cuban I have often thought about this bar, and was happy that it’s coming back. It was a rare treat when dad brought home a Cuban Lunch for us. I also had another favourite, the Cherry Blossom, a large domed chocolate bar that was almost too big to get your mouth around. It was enrobed with chocolate peanut coating and in the center, a maraschino cherry! I hope you out a store or supply Eastern Canada will the Cuban Lunch. Would love to try you Mother favourite chocolate bar. I remember this candy bar from way back. When I saw that a woman from Winnipeg has brought it back to life, I was so excited to hear that, so now I need to know where I can purchase it. It was my absolute favorite. If anyone knows how to contact her or if they are going to sell here in Thunder Bay please let me know. Paulin’s Chambers Co. Ltd. became Interbake Foods(1988) Ltd. before it closed January of 1991 and that is when most of the product were no longer produce in Winnipeg. The building still stand at 311 Ross Ave with the name still on the building. Plus there were three plants in Canada – one in Quebec, Ontario and Manitoba. The three companies were sold by Weston (a Toronto based company) to a Quebec Manufacturer (Culinar? I can’t remember the spelling nor could I find it on the web)about three years before the closure. Plus there was some news about the closure at the time but the distribution stayed open for a few years after the food manufacturing plants closed. Well I finally found the New Cuban Lunch at Sobeys here in Edmonton …definitely NoT like the original…think the new bar needs to be perfected more . The dark chocolate did not exist with the original …plus the nuts were chopped instead of whole …the taste is bland ( not sweet) and very dry !! No there were no chips , only peanuts halves also they were not made with dark chocolate it was milk chocolate and had a very unique taste.